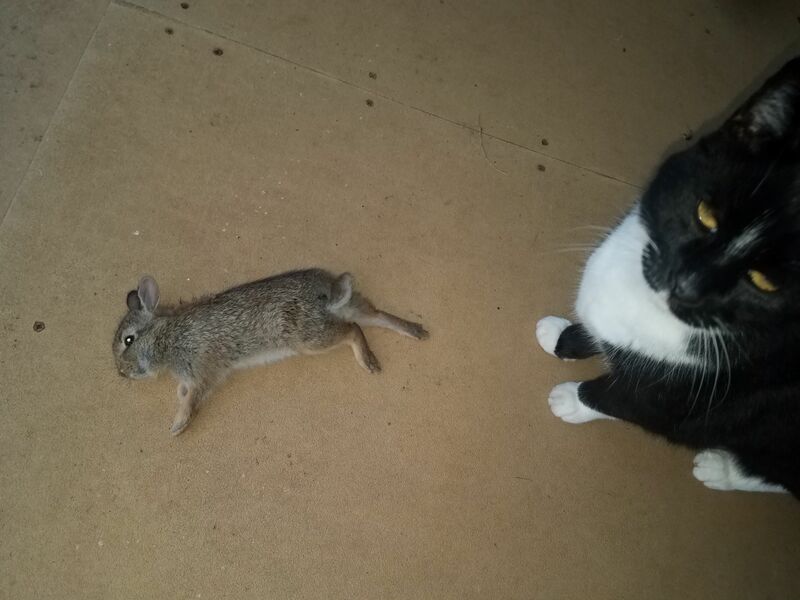 My cat gets a rabbit every other week or so. He usually eats the whole thing himself but I was wondering if I should try and cook it for myself. Is there even enough meat on them to make it worth the effort? If I had to guess they probably weigh about 1lbs (cat weighs 15lbs). Would it be legal in the state of Washington? The short answer is yes, but most people would not. Our cat would do the same thing as yours, when we lived in the country. Sometimes the rabbit was just as big as the cat. We never cooked our cats kills, but I know neighbors who did and they generally made a type of rabbit stew out of them. There are lots of recipes on the internet for rabbit stew like here, here and here. I recommend using lots of vegetables in the stew. It makes it seem tastier, at least to me. And yes rabbit stew tastes excellent. That I have eaten. If the rabbits are quite small you can always put them in your freezer until you have enough for a banquet! It would seem legal as your cat killed its own prey out of instinct and I truly doubt you trained it to kill rabbits. Our cat more often than not brought them home and put her kills at the front door as trying to say: "look what I brought home!" Based on several sources related to parasites that can be found in rabbit meat, as noted in other answers in this post, it is difficult to correctly diagnose whether a rabbit has been infected or not without using a microscope of tissue samples during necropsy. That also includes the following worm types: ringworm (see Dermatophytosis); trichinosis; larval worms, or tapeworms; pinworms; and roundworm. While those particular worms can be located in either the liver, intestines, colon, and/or feces (as either eggs, larva or adult worms), they can infect other organs (such as roundworms migrating to the brain or eyes of a host, or ringworm appearing on the skin) making diagnosis via visual indicators difficult without transmission should proper PPE not be used. Other parasites/bacteria/diseases of rabbits include, but are not limited to: coccidiosis (two different types); walking dandruff ("can cause mild dermatitis"); encephalitozoonosis; and, most notably, tularemia. When preparing a rabbit for consumption, it is recommended that you wear gloves and proper clothing since tularemia can be transmitted through contact of the skin, especially blood. (Several sources include: link1 link2 link3 link4 link5). While indication of tularemia in rabbit meat can be seen in the liver, it is recommended that you cook the meat to a min. 160 F / 72°C if cooked from fresh.. Cooking the meat to that internal temperature can also deal with internal worms (though it is recommended that you remove the intestines, taking care not to damage or rupture the organ in the process). Note: Given that some of these infections can be transmitted to other animals, such as cats, take care to keep up with regular vet checks to monitor and maintain the health of your cat. Use a meat thermometer and make sure your meat is cooked through to 165 F / 74 C.
Tularemia, sometimes called rabbit fever, is a bacterial disease which spreads through skin contact, but is killed by heat above 160 F / 71 C.
While eviscerating the rabbit, check the liver for numerous white lesions about the size of a pin head. If you find these, the rabbit should be discarded and not eaten. Trichinosis is caused by roundworms and is also killed by heat above 160 F / 71 C.
If any of the intestines have an abnormal smell or discharge, or if pockets of blood are seen in the muscle unassociated with the bullet/shot/arrow wound, the flesh should be considered unfit for eating. The abdominal cavity should be cleaned, dried and cooled until the meat is processed. During warm weather (over 65° F, or 18.3 C), bags of ice should be placed in the body cavity to hasten cooling. The carcass should be protected against flies. Any uncooked game should be promptly frozen, refrigerated or disposed of properly. My greatest concern would be safety if eating it. Animal can be infected with parasites or germs cooking cannot get rid of. And testing for them would prove too expensive for such a small quantity of meat. As for the legality of it, be sure to check with your local authorities. A man in Texas got a visit from a game warden for illegally taking wildlife when a dove flew into his window. Texas Monthly Washington state hunting guidelines state that pygmy rabbit hunting is closed, and they are a threatened species so please do be careful in this respect. Not the answer you're looking for? Browse other questions tagged hunting rabbits or ask your own question. How to tell the difference between a pika and a cottontail rabbit? “Don’t step on anything you can step over.” - What does this mean? What diseases can be transmitted through skin contact with a dead rabbit?